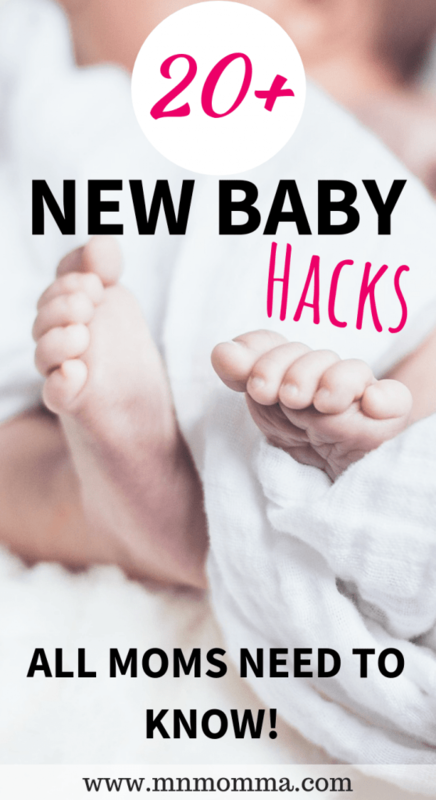 Wouldn’t it be great if there was a handbook filled with all the newborn tips and tricks – the complete book of best newborn hacks? It could be given out to every parent when they have a baby and we’d all be experts? 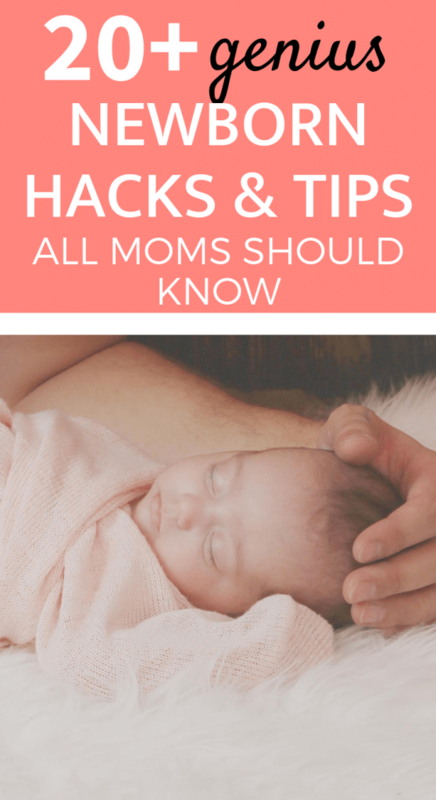 Unfortunately, it’s not that easy, but these fabulous newborn hacks from moms around the world will help save you time and sanity! If you’re looking specifically for breastfeeding and pumping hacks check out this post or grab your copy of Pumping 101! Since I’m an Amazon Prime lover (because I just want my package in 2 days! ), I’ve linked that product or a similar one from Amazon. If you haven’t seen this amazing trick yet – your mind is about to be blown. You know those cute little folds up by the baby’s shoulders on a onesie? Those aren’t just for looks. If your baby has a blow out (aka a poopy diaper that’s overflowing), just take those little tabs and fold them back over your baby’s shoulders and slide the onesie off from the bottom. So easy! And so much better than trying to pull a gross onesie over your baby’s clean head. Bonus tip: roll the onesie down as you go. This helps keep any poop contained. Also – be sure to rinse the onesie and wash as soon as possible. Since we’re on the topic of wet or poopy diapers, make sure you pay attention to the colored line down the front of your baby’s diaper! The line is typically yellow when you first put a clean diaper on your baby and will change to blue if your baby has a wet diaper. Can you say easy or what? When getting a diaper bag, make sure you choose one with a changing pad included. It’s amazing (and frustrating), how many placed still don’t have diaper changing stations for babies. We absolutely love this diaper bag and the foldout changing pad couldn’t be easier. 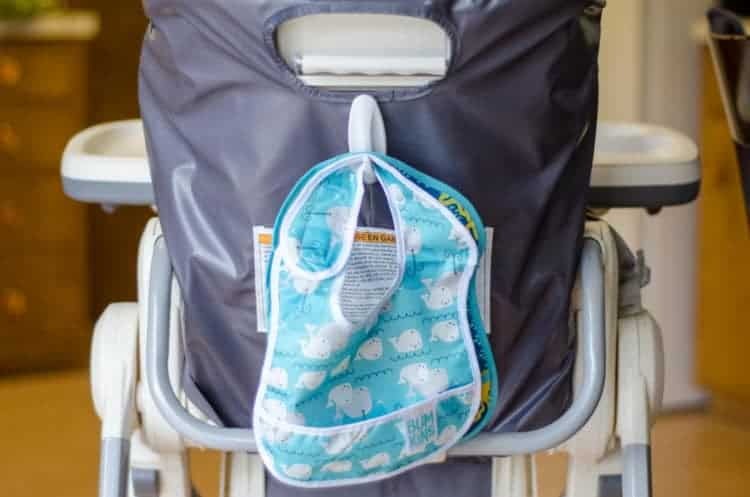 If you already have a diaper bag you love that didn’t come with a changing pad, just be sure to buy one like this and store it in your diaper bag. 4. How to Swaddle the Easy Way – Hello, Velcro! Most baby’s LOVE to be swaddled, but if you’ve never swaddled a baby before, it can seem a little intimidating. So you have two options. 1 – get to practicing that swaddle! 2 – go with the velcro. These swaddles will make those 3am diaper changes so much easier! You won’t be worried about if you folded the blanket right and you won’t be fumbling around in the dark. You know how I just talked about fumbling around during the night? There’s nothing worse than trying to button your baby back up and you just can seem to figure out the darn buttons because it’s 2am, you’re exhausted, and it’s dark. Save yourself a headache and get back to sleep faster by investing in a cute pair of jammies that zips up instead. Unfortunately, your baby will probably not sleep through the night as soon as you bring him home. That being said, there are some things you can do to help your baby stay in a sleepy mode even during diaper changes or nighttime feeding sessions. These baby night lights are dim and easy to turn on and off, helping your baby stay drowsy. 7. Sleep Sacks – Use Them! Whether it’s a velcro swaddle, a sleepsack, or eventually Merlin’s Magic Sleepsuit (which saved our sanity and sleep – read about it here! )- don’t be afraid to use sleeping tools for your baby! These tools were developed to help your baby feel secure and comfortable – so use them to your advantage. After all that talking about getting a baby to sleep, sometimes you have to wake them. This usually only happens during the first few days or weeks when your baby is exhausted and needs to wake up to eat. Newborn’s grow fast! Whether your little one started in newborn clothes or was in 3-6 months right away, you know that time goes too fast. Have a tote handy to put all the clothes your baby outgrows into. It’s easiest if your totes are organized and labeled by size. Also look for totes that are easy to slide under a bed or crib, or can be easily stored in a closet. If your baby has to have medication – it can be one more thing to keep track of. 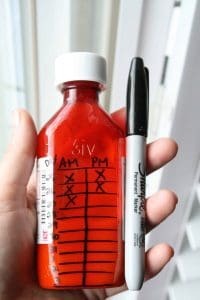 Thankfully there’s an easy method by LoveZilla – just grab a sharpie, make yourself a little chart, and X off each dose that’s been given. *Nurse Tip: Unless directed by your doctor – make sure you always follow the instructions on medication and give for the FULL number of days/doses stated. Don’t stop halfway through your medication just because you’ve started to feel better. Unfortunately, your sweet little bundle of joy isn’t going to only poop in their nursery. Whether you’re on the road or just upstairs, having a portable changing station can save you time and a potential blowout. 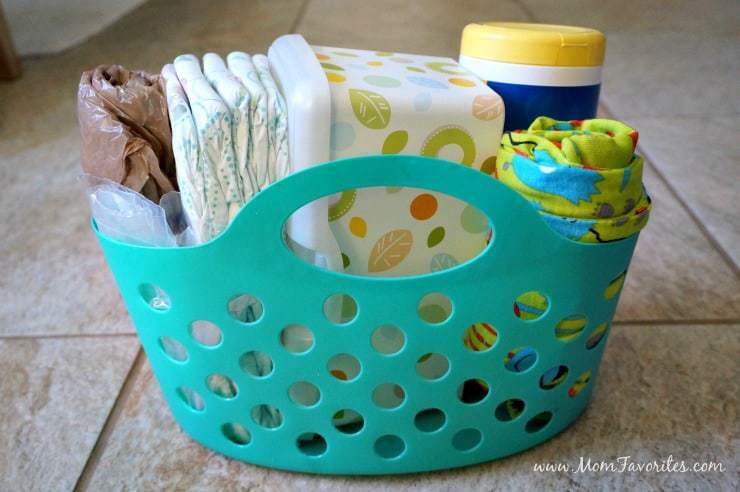 Creating an emergency diaper changing tote is so easy and cheap! This full DIY dollar store hack can be found here at Forks and Folly. If you’re looking to make a few of these, Amazon has a 3 pack for a great deal! 12. 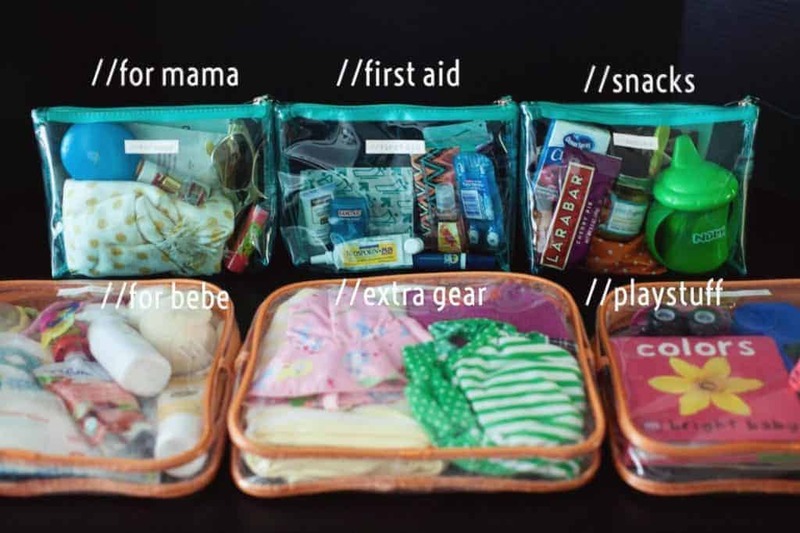 An Organized Diaper Bag – Finally! Gone are the days of rummaging around your diaper bag looking for that pacifier or spare onesie you packed for blowouts. Instead, you can make your diaper bag incredibly organized with these cheap and effective plastic zipper bags. Pssst. Keep one empty for dirty or wet clothes, trust me, you’ll thank me one day! Check out the 5-pack from Amazon. For all the details check out Kid to Kid here! When your baby’s ready for solids, it can be a mess. Keeping bibs close will save you time and help keep your crazy kitchen organized. Simply attach a plastic command strip hook to the back of your baby’s high chair and you’re good to go! Your baby’s bib has an easy “home” and you’ll never worry about one getting lost in your cupboard. You can grab two of these from Amazon for a ridiculously low price right now. Check out The Krazy Coupon Lady’s hack here! To save you time scrubbing your floors (and save your sanity! 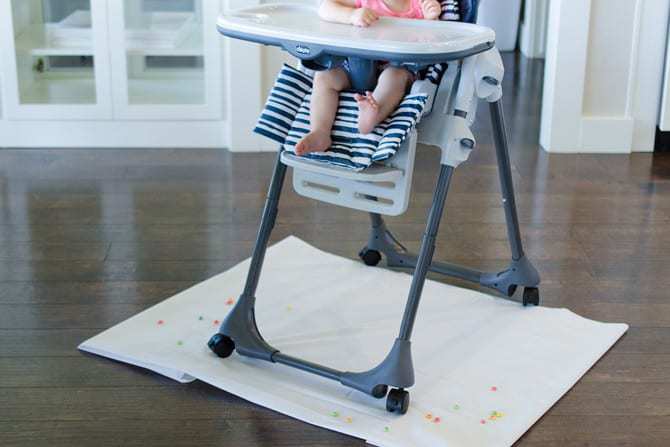 ), just grab a shower curtain or paint drop cloth and put it under your baby’s high chair. Trust me, cleaning up has never been this easy. If you plan to try or currently use baby led weaning, then this tip will be life changing. Amazon offers a cheap paint drop cloth like this one for less than a cup of coffee! While we’re on the topic of food, you can’t miss these bibs! The Big Mouth Bibs are one of the best baby products we ever purchased. While it’s pretty self explanatory, the bib catches any food your baby would have otherwise dropped on herself and her outfit. Cleanup is also incredible easy as these unsnap and can be washed in the sink and left to dry quickly. is for you. We’re talking a full upper body bib – sleeves and all! 16. Keep Track of Your Baby’s Feedings, Diapers, & Sleep With Ease! You have enough to worry about as a new parent. Worrying about writing down when your baby last ate, how many wet diapers he had or how long his last nap was shouldn’t have to be difficult! Thankfully, with the FREE Medela App, it’s super easy to keep track of all your baby’s happenings. I know your phone is close by, so grab the app and make tracking easy! 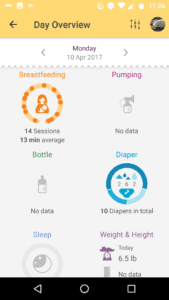 You can download the Medela App here (Android or iPhone)! 17. The Easiest Way to Keep Track of Freezer Milk – This Milk Log! Okay, so this newborn hack is for moms and baby. If you’re choosing to breastfeed or pump breast milk, this milk log is going to be a life saver! Just write down the date, time, and number of ounces you froze and easily keep track of how much milk you have available for your baby. I can’t tell you how many times I went out to our deep freeze and counted the ounces (sometimes less than 5 minutes apart! Hello mommy brain!). 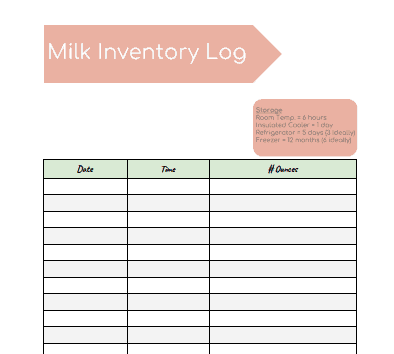 You can get this milk inventory log free by subscribing to my newsletter! 18. All-In-One Baby Cover: Nursing Cover, Car Seat Cover, and More! Stop wasting your time with a car seat cover, a nursing cover, a shopping cart cover, and a high chair cover. This cover does it all. So if you’re hoping for one less thing to keep track of (and wash) – don’t miss it! It also comes in some adorable colors and is SO soft. Pssst….if you’re looking for a cover that’s almost half the price – check this one out – it’s also a 4 in 1 baby cover! Whether you’re a pumping mom or a formula feeding mom – you know the pains of constantly washing and sterilizing bottles and pump parts. You can easily save yourself some time by using Medela’s Quick Steam Bags! Simply add the pump parts or bottles, put some warm water in, and throw it in the microwave. The instructions state that these bags aren’t just a one time use, but can be used up to 20 times. As your newborn gets a little older, her eyes will start to wander. She’ll hear sounds and want to look or she’ll see something out of the corner of her eye, and it’s over! Your super easy breastfeeding session is now a fight to get your baby to concentrate. A nursing necklace can help keep your baby distracted towards you and help keep her hands busy why nursing. Bonus: the necklace can also be used as a teether! Learning your baby’s feeding cues is HUGE. You’ll help prevent some excess crying and frustrations – for both baby and parents! Your baby will start to give you signs that she’s hungry before actually crying. For more on early feeding cues – check out this post! While these newborn tips can’t guarantee your baby will sleep through the night or never have a blow out, but they sure can’t hurt! 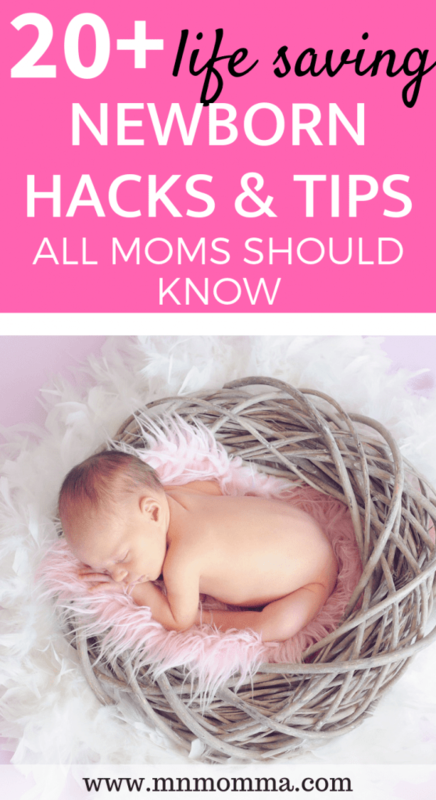 Are there other newborn tips that you swear by that I forgot to mention? Let me know in the comments below! And if tips and hacks are your thing these IKEA Nursery Hacks or IKEA Hacks for Kids might be just perfect for you!